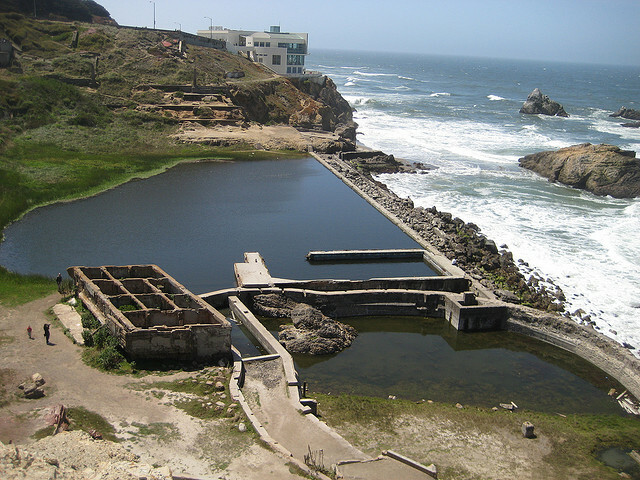 The Sutro Baths, whose ruins on the western headlands of San Francisco now form part of the Golden Gate National Recreation Area, were originally created by millionaire Adolph Sutro as an opulent 3-acre public baths featuring seven pools of varying temperatures, water slides, trapezes, springboards, and other attractions. It opened in 1896 and was able to accommodate approximately 10,000 bathers at a time. The Baths subsequently underwent many changes and eventually burned in 1966; the Golden Gate National Recreation Area acquired the site of the ruins in 1973. This year, London resident and Brunel University student Adam Smith developed an online interactive map of the Sutro Baths after a visit to San Francisco. Smith researched historical photographs and blueprints of the Sutro Baths using the online resources available at the San Francisco History Center’s Historical Photograph Collection, Gary Stark’s Cliff House Project, and the Western Neighborhoods Project. Smith also drew from material in Marilyn Blaisdell’s 1987 publication, San Francisciana: Photographs of the Sutro Baths, a copy of which he discovered in Green Apple Books. Smith consolidated this material and used Google Maps to create an online interactive map. He concedes that his map is only an approximation of the layout of the original Sutro Baths, superimposed over the current location of the ruins. Nevertheless, Smith has succeeded in providing the user with a fairly detailed sense of the layout, complete with photographic views that can be clicked on from various vantage points. Furthermore, his map is interactive in that it allows users to rate the map, report problems, and leave comments. In this way, Smith’s map provides an example of Web 2.0 – that is to say, a website in which users, as well as the creator, can provide original content and participate in the development of the site. Other examples of San Francisco history projects that involve Web 2.0 features are blogs such as Sparkletack and wikis such as FoundSF. Given Smith’s facility for transforming historical content into a Web 2.0 format, it’s not surprising that his inital love for San Francisco was itself cultivated through participation in a Web 2.0 game called San Francisco Zero, in which participants challenge one another online to use public spaces around San Francisco in new and unexpected ways. Smith, who can be reached via his Google profile, hopes to re-locate to San Franciso upon completing his studies. For any of us who use San Francisco history, Smith’s map suggests new possibilities for how the Web can continue to be used to present historical content in a way that is not only interactive, but that also allows users the opportunity to contribute. The interactive plan of the Sutro Baths is fascinating. I’d love to see this technique applied to other lost historic spaces for which good documentation exists. One that comes to mind is Dr. Magnus Hirschfeld’s Institute for Sexual Science in Berlin, a structure sacked by the Nazis in 1933, then destroyed by allied bombing during World War II. • The upper left corner of the first case features a promotional circular for the Sutro Baths published in 1900, along with a label noting that some evidence exists that homosexual men used the baths as a place to discreetly pick up men for assignations elsewhere. • The second case includes a Crawford Barton photo of a handsome, seminude Asian American man posing in the ruins of the Sutro Baths in the early 1970s. And the descriptive text panel at the base of the same case features a photo of bisexual night at the new Sutro Baths, a bathhouse of the 1970s-early 1980s named in honor of the historic original.